A remodeling project is your chance to switch things up and attain a new look and feel for your property. At My Flooring America, we are committed to helping you transform your favorite rooms into works of art. When you want to strike a good balance between everyday durability and a striking aesthetic appeal, we recommend wood-look tile. In Webster, TX, we offer a wealth of flooring options for you to explore. Find your favorites and turn those remodeling ideas into a reality. Get the flooring products you need, along with the support and service you can trust. At our flooring showroom, we offer the materials and resources you need to complete your remodeling projects. Whether you are re-flooring a single room, multiple bedrooms, or your entire property, we’re here to help. Our flooring showroom features samples of wood plank porcelain tile and ceramic tile. A wide variety of flooring in different colors, styles, and configurations are available. If you aren’t sure where to begin, let us know! Our team is well-versed in the flooring and interior design trends, which means we can make recommendations that meet your needs. We’ll also coordinate professional installation so you can enjoy your selections as quickly as possible. Enjoy the beauty and majesty of solid hardwood, along with the ease of maintenance and everyday durability of luxury vinyl planks. 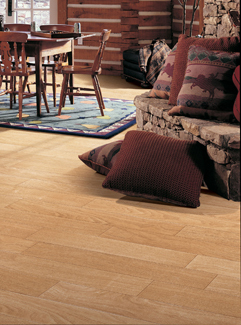 As its name suggests, wood plank ceramic tile is flooring that takes on the appearance of hardwood. Thanks to a sophisticated manufacturing process, this flooring material offers a high degree of strength and resiliency, while imparting the look and feel of wood. One of the most striking features of wood-look tile is its resemblance to solid hardwood. The grout of this flooring can mimic the natural grain patterns of wood. Also, the tile’s strength and durability allow it to be installed in spaces that hardwood normally can’t go, including the kitchen, bathroom, and basement. Get the right flooring to meet your needs. Our showroom features ceramic and porcelain wood tile, allowing you to find the right flooring for your indoor and outdoor spaces. At our showroom, we have samples of many wood plank tile products, including products that closely resemble species like pine, mahogany, oak, and more. Contact us to learn more about our wood-look tile options. We proudly serve property owners throughout Webster, TX, including Clear Lake, Houston, Nassau Bay, Sea Brook, and the surrounding area.